In order to speak with your friends or colleagues you need to connect to a server (which has to be set up before connecting to it; see the server manual). Open the menu “Connection” and press “Connect”. Your local addressbook is still empty but we are going to add a server here. Press your right mouse button in the white left section and click on “Add server”. You can name the server anything you like. After that “Label” shows your previous chosen name. Now fill in the Server address in the specified field, this may either be an i.p. number (like 127.0.0.1) or a name (voice.teamspeak.org:9500). The port of the server usually doesn’t need to be filled in. However if the server host is running multiple server you can specify the port where it needs to connect to behind the server addres with :portnumber (like in the name example) After that you can choose a nick in “Nickname”. You are obligated to fill one in unless you checked the “allow server to assign nickname” box in which case you will get a name like “guest01”. If the server is password protected you need to fill the appropiate one in at the “Password” field. If you are bugged by time-outs (unwanted disconnects from the server) check the “Auto-reconnect” button. If you have registered with the server before you can optionally fill in your Login Name and Password (Important: do not fill in anything if you haven’t registered with the server before!). Remember to check “Registered” and fill in some Nickname!. You may even fill in your favorite channel or subchannel you wish to connect to (optionally fill in the password to the sub-channel if required). After that hit the “Connect” button at the bottom. If all went well you are now connected to the server. You should see your name with a green light next to it. You can add as many servers in your local addres book as you want. They will be stored automatically. “Cancel” cancels the window. The Connect to server has another tab called “Web server list”. 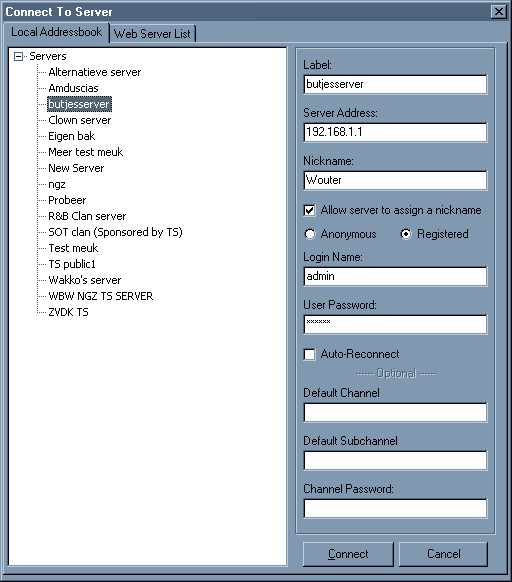 In this tab all the servers are listed that have their server designated as public servers. If you want to connect to one of those server just highlight the server of your choice by clicking on it and then click the “Connect” button below in the window. You can easily add this server to your local address book by highlighting the server and click on the “Copy to local Addressbook” button. If a server was created while you already opened the Web server list you can hit the “Update” button in order to have the list refreshed and have the most recent list. “Cancel” cancels the window. When finished filling this in in the address or location bar of your favorite webbrowser hit enter and TeamSpeak will start up automagically and log you in according to the parameters given. Note that you do not have to enter all this information if you just want to connect to a server via your webbrowser. Just the DNS or ip will do to log in to a server as a guest.